Hot Dog is relaxing on some comfy bread with a little corn and some fries when suddenly...disaster strikes! It looks like he's about to become lunch. Prepare for a laugh-out-loud picture about this little hot dog's quest for freedom. 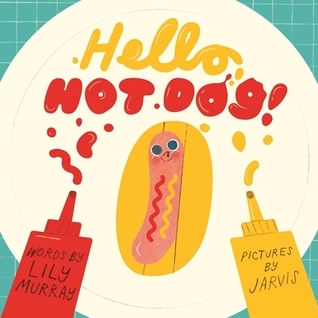 Boldly illustrated by the brilliant Jarvis, winner of Best Illustrated Book at the V&A Illustration Awards 2017, this hilarious, irrevere Hot Dog is relaxing on some comfy bread with a little corn and some fries when suddenly...disaster strikes! It looks like he's about to become lunch. Prepare for a laugh-out-loud picture about this little hot dog's quest for freedom. Boldly illustrated by the brilliant Jarvis, winner of Best Illustrated Book at the V&A Illustration Awards 2017, this hilarious, irreverent picture book is told entirely in speech bubbles and demands audience participation - and your undivided attention!